Potential is defined as latent qualities or abilities that may be developed and lead to future success or usefulness. I believe that any OCR held at the King’s Domain site just north of Cincinnati has the potential to be an epic event. It has everything an obstacle race should include; lots of woods, a mix of dirt and rocky trails, crazy steep inclines, and obstacles, oh so many awesome obstacles. BattleFrog utilized this course to put on what many believe, myself included, the toughest regular OCR ever put on in August of 2015. I can already hear the Spartans cry “what about the Wintergreen Spartan Super in 2014?” Well ladies and gents I was at that race as well and last year’s BattleFrog Cincy was much worse for the Elites, so when I heard they would be returning to King’s Domain this year I was all in. 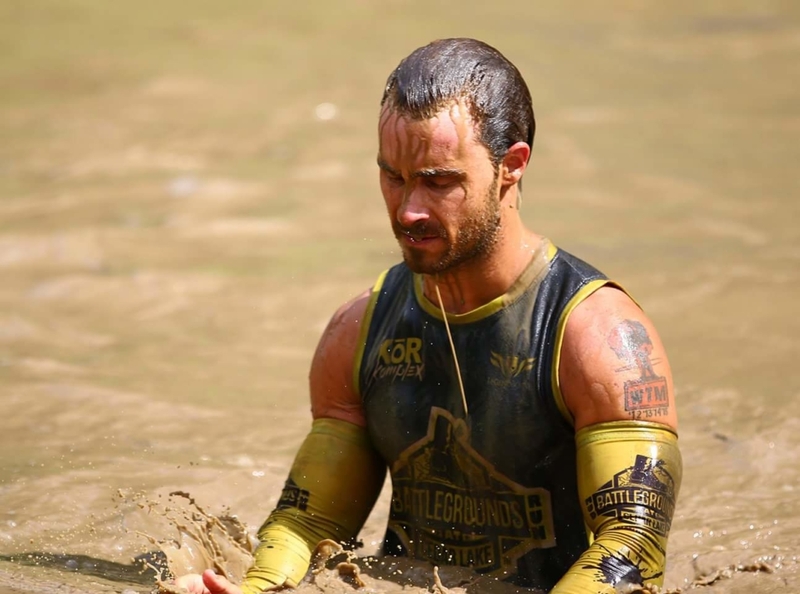 I actually decided to further punish myself in preparation for this years’ OCR World Championship and World’s Toughest Mudder by signing up for the BFX. I figured, “why not attempt to run four Elite laps rather than just two!” This was to be my first go at BFX, so why not select the most difficult course to tackle it with a lot of other badass ultra OCR racers? Walking up to the registration and festival area I immediately noticed that BattleFrog has made some changes. The entire area was well thought out and planned. Registration pick up was smooth and then they forced you through their merch tent which is a great marketing ploy to entice you with all their great “stuff.” The only negative to the festival area was the placement of the BFX tent. It was actually a great spot for us, unfortunately, spectators agreed because our tent was right next to the splashdown pool at the bottom of King’s Domain’s fantastic 100-yard water slide! This meant there were a lot of people hanging around our pretty much-unguarded stuff. I don’t believe there were any issues but it did get annoying when the spectators would borrow our chairs since we sometimes need them during our quick pits. One of the things that made the festival area of a BattleFrog so great is the presence of Coach Pain! If he can’t get you going in the morning then you must need a good gallon of caffeine or something maybe stronger! He pays special attention to the BFXers… especially those who are late to the briefing, so by the time we are let loose we are basically snarling. However, once we left the start line and finished the first mile that was, unfortunately, where the BFX race feel ended which was an unexpected surprise for me. However, I will get back to the BFX a little later. Look, if you began this review looking for a play by play of the obstacles, well sorry that’s not what I’m going to lay out for you. Find a course map or a YouTube video of the race if that’s what you are looking for. 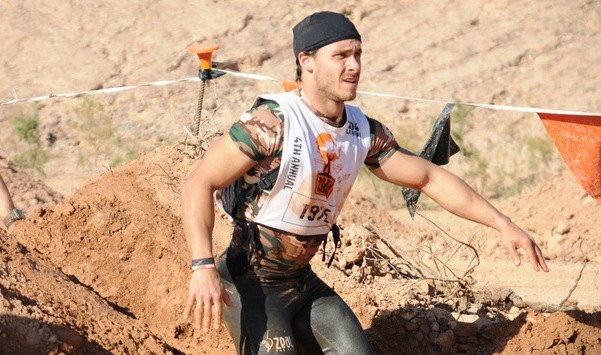 What I am going to attempt to do is paint a picture of how this event went and see if it lived up to its “potential.” I believe you will find that this lived up to the BattleFrog reputation of being a very tough OCR. However, there were things that I saw out there which I simply cannot happen at ANY OCR event. One of the things I most remember about the course last year was the treacherous Jerry Can Carry and the arduous Wreck Bag Carry. Mother nature played a big hand in the course that we ended up with but Kevin Jones laid out a great design and the build crew did a great job, for the most part, of bringing that course to life. However, the area received a lot of rain in the week prior to the event so a few things had to be altered; unfortunately, one of those being the complete removal of the Wreck Bag Carry. The Jerry Can Carry was also very different from last year, and that brings me to my brightest point of this event. Battle Frog pretty much nailed the “scaling” for their obstacles. It was pretty awesome to see “Novice,” “Intermediate,” and “Elite” lanes at everything from the Jerry Carries which even had different loop difficulties, to their Platinum Rigs, to their Tip of the Spear. Nearly all of their obstacles gave racers the ability to choose their difficulty. This is a great thing for Open Wavers, but not so much for BFXer’s who, in my experience, seemed generally content with completing the Novice levels all day long. However, there was one obstacle that they couldn’t scale and it was at this spot that will forever tarnish the memory of this event in the eyes of many of those in attendance; and that was vaunted King’s Domain Monkey Bars. Simply put, the Monkey Bars at King’s Domain were altered from previous races and it ended up making the obstacle very unsafe. The pool under the bars would no longer hold water so cargo nets and hay bales were added instead. During the build crew testing of this King’s Domain design, there was the realization that if people used their feet and fell on their back then serious injuries would occur. 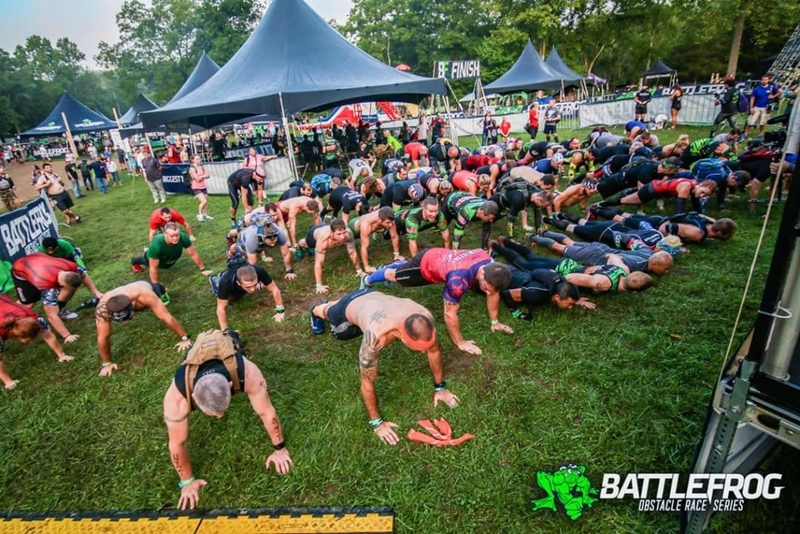 BattleFrog made the decision to not allow people to use their feet which resulted in a much higher obstacle failure rate. What racers also experienced at this obstacle was a major increase in injury rate due to the improper safety netting below the obstacle. Eye witness elite racers who were stuck at this obstacle for up to three hours reported seeing numerous injuries including a broken leg, a broken ankle, one guy was knocked unconscious, other people getting the wind knocked out of them along with numerous other issues. Throughout the course of this race other obstacles were modified or closed due to safety concerns, but not the monkey bars. Racer after racer, attempt after attempt the carnage continued with nothing being done. Could this ignorance of the severity have played a role in the timing of BattleFrog’s decision to cancel all future races we will probably never know, but let me tell you in was ridiculous to witness in person. I decided to race the BFX division of this event because I was looking for something different in this event. I wanted to be able to practice as much as I possible could to help be prepare for the championship race season. I figured BFX would be a great way to do this because it was like an Ultra-OCR. As it turns out it really didn’t feel like that at all. You see BFXer’s are (were) allowed certain concessions since we are going to be out there attacking the course all day. I was under the impression this meant we didn’t have to complete every single obstacle only that we give it our best attempt. For example, at the Platinum Rig, we were to attempt the Elite/Intermediate lanes until we couldn’t do them and then drop down to the Novice lane. If that wasn’t possible then do the Penalty Loop. At this race, we were also given different loop levels at the Jerry Carries. What I witnessed in some BFX racers was sad in my mind. I understood the “spirit” of the BFX race was to challenge ones’ self, what I saw was very capable racers consistently taking the easy road in order to attain the best race placement. I’m not saying that I saw cheating because this was all allowed but they certainly could have given a greater effort. Maybe it’s because I realize the value in grinding it out from all my hours at WTM but this disappointed me. The fault likely had more to do with the creation of rules that allowed the BFX racer to make these concessions. As we have begun to see over the last few weeks, decisions like this cannot be left up to the racers in the heat of competition because sometimes we will not make the best decisions. The safety of the participants must always come first. When people come to an event what matters is all about them receiving a phenomenal experience. Having one particular obstacle or a great medal will never be able to overcome a bad overall experience. Make sure nearly EVERY athlete leaves feeling good about themselves and the event and they will tell others about it. Make it clear what is expected of the athletes on the course. Make sure your volunteers are trained. Make sure your staff is happy. Make the event fun! Give the participants something to brag about and then the numbers will grow. If a race or even an event company has “potential” and they drop the ball as BattleFrog did in this instance then disappointment will soon follow. I was extremely happy with my own performance in this my one and only BFX, but I left this event with a bad taste in my mouth and I don’t think it was the water from the water slide. I feel like it is was the disappointment that, in this instance, BattleFrog failed it’s participants and didn’t live up to their potential. I guess it’s fitting that this be their last OCR even though I wish it wasn’t. I want to end this by giving a great big “HooYah” to all of the BattleFrog staff who are now out of work. Thanks for putting on a fun series and for all the great experiences! You will be missed! I completed my first rig at Cin Battlefrog. Also was BFX. And I agree with what you saw. I witnessed 2 BFX go right by tip of the spear. 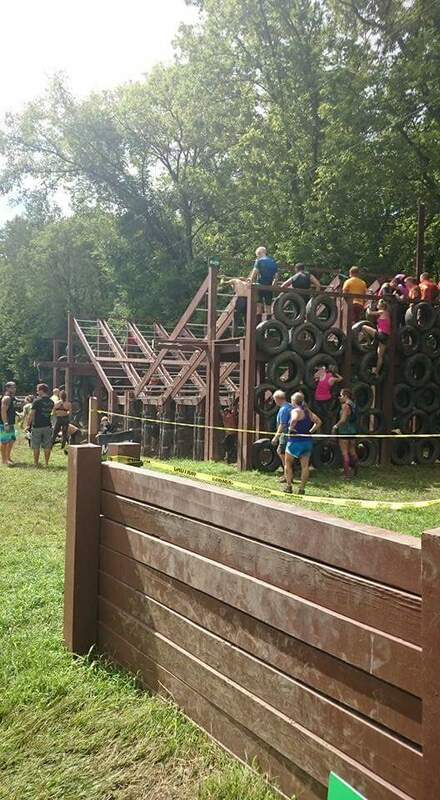 My biggest complaint about this event was the stacking of virtually every upper body obstacle (minus the rope climb and jerry can carry) in the center of the course near the monkey bars. While I’m sure this was great for spectators, it wreaked havoc on elite racers (which had a 61% failure rate). I enjoyed the challenge, but not everyone wants to spend 4 hours on a course walking around shaking your forearms out before you finally give up your band. I managed to keep my band, so this isn’t a “woe is me” thing, but I seriously wonder how you get a ton of repeat customers with this type of failure rate (obviously doesn’t matter now). The flow of the course was, in my opinion, terrible. Adventure hike, every obstacle possible, adventure hike, slide. I finished the race with mixed feelings – accomplishment from completing everything but didn’t really have much fun otherwise. My son came in 10th in the BFX (did five laps)….he did the dangerous Monkey Bars twice with no problem but opted for the Penalty the last three times since the obstacle was so crowded. He loved this race (it was his second BFX). He was on the Battlefrog College Championship show representing EKU and hopes to compete on there again. Meanwhile, he runs a variety of OCR races of different lengths. He is sad there will be no more Battlefrog Series. That might have been part of the draw though Carl…not for the average person (who obviously can use easier lanes and such and has no worries about bands) but for someone challenging themselves, a failure, a lost band, that could very well be the motivation to do another as a sort of redemption. At the very least that’s what I seem to get from conversations with folks that have lost their bands (oftentimes doing exactly as you said…fail obstacle, sit and walk around for a couple hours reattempting, finally surrendering). I know for a fact that at least one of my friends was disappointed he would never have another chance to earn his band after losing it last year and this year.